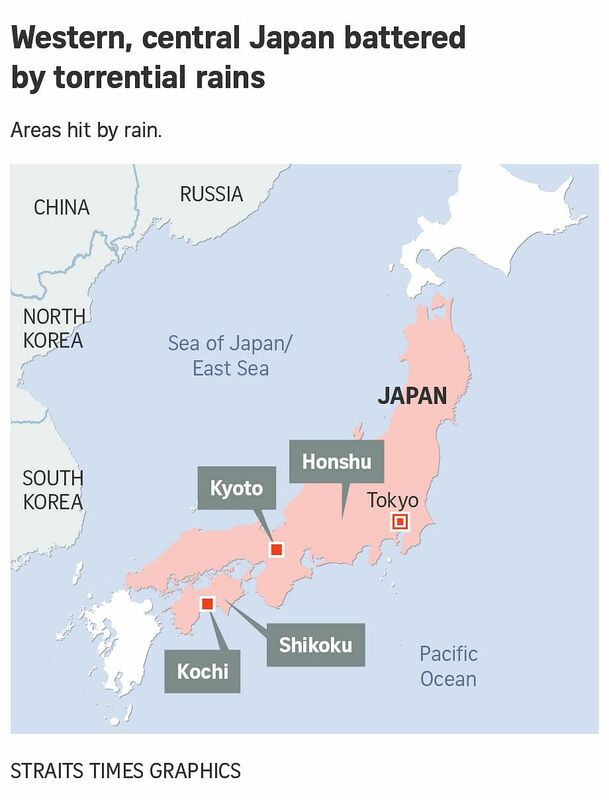 TOKYO (REUTERS) - Hundreds of thousands of people across a wide swathe of western and central Japan were evacuated from their homes on Friday (July 6) as torrential rains pounded the nation, flooding rivers, setting off landslides and leaving at least two people dead. The Japan Meteorological Agency said the rainfall was"historic" and warned more rain was set to batter already saturated parts of the nation through Sunday. At least two people were killed, one when he was sucked down a drainage pipe and another an elderly woman toppled by a gust of wind. Several more people were missing, including one whose car was swept away as he delivered milk in the early morning hours, NHK national television said. A middle school boy was missing after he was swept away by flood waters in a ditch, NHK added. "The situation is extremely dangerous," wrote a Twitter user in Kochi, a city on the smallest main island of Shikoku, where the rain has been especially intense. Several dozen people were injured, four seriously, the Fire and Disaster Management Agency said. A number of people were buried in a landslide on Friday morning and rescuers were working to dig them out. Around 210,000 people were ordered from their homes due to the danger of further landslides and flooding, and 1.2 million more were advised to leave as of Friday morning, the Agency added. This included parts of the tourist city and ancient capital of Kyoto, where authorities had closed off some bridges and waterside promenades as rivers swelled. Japan's Self Defence Forces dispatched 180 personnel and 50 vehicles to Kyoto as trains across western and central Japan were stopped, including part of one Shinkansen bullet train line. The torrential rain appeared to have been touched off by warm, humid air flowing up from the Pacific Ocean and intensifying the activity of the seasonal rain front. Remnants of a now-dissipated typhoon that brushed Japan earlier this week also contributed, officials said. One part of the smallest main island of Shikoku was hit by 98 mm (4 inches) of rain in the hour to 8:00 a.m. on Friday, with a total of 908 mm (36 inches) in the 48 hours previously. Some parts of Japan were set to see up to 400 mm of rain in the coming 24 hours, with the rain set to continue until Sunday. Japan's weather woes are far from over. Typhoon Maria, forming deep in the Pacific, is set to strengthen, possibly into an intense Category 4 storm, and may directly target the southwestern islands of Okinawa early next week.